If you want to show off that you can cook like a James Beard Outstanding Chef awardee, then Cheers To The Publican is for you. 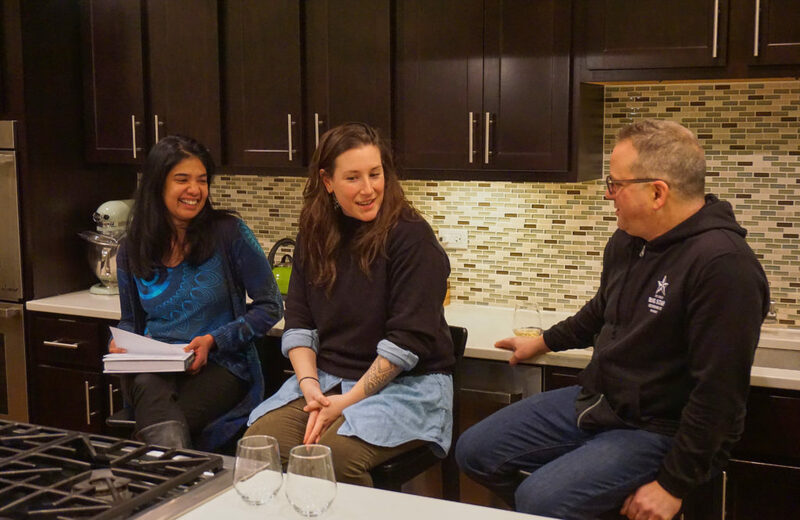 The recently released cookbook is co-authored by Chicago culinary giant Paul Kahan with writer Rachel Holtzman and Cosmo Goss, now a former chef de cuisine at The Publican. Restaurants in the One Off Hospitality group headed by Paul and his business partners — which include The Publican, Blackbird and avec — played a major role in converting the gritty meatpacking district in Chicago’s West Loop neighborhood into the city’s Restaurant Row. 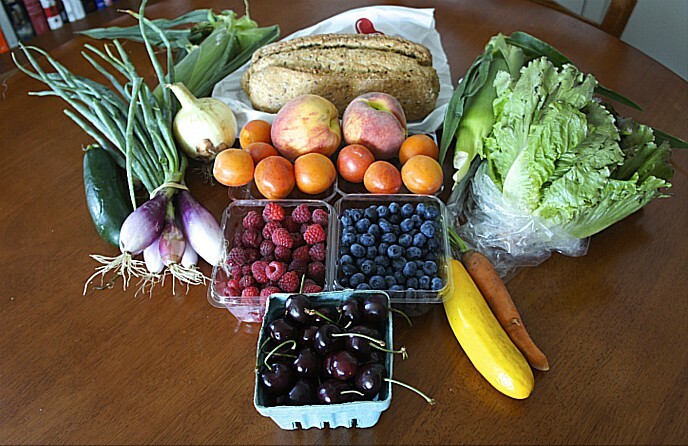 As the book makes clear, Paul is a farm-to-table pioneer known for his devotion for cooking with the best ingredients available, many of them locally and sustainably produced. Farmers, livestock producers and fishermen from whom The Publican regularly sources get shoutouts in the narrative passages of the book, including such longtime friends of FamilyFarmed as Dave and Susan Cleverdon of Kinnickinnick Farm (Caledonia, IL), Beth and Brent Eccles of Green Acres Farm (North Judson, IN), Herb Eckhouse of La Quercia Meats (Norwalk, IA), Mick Klug and Abby Klug Schilling of Mick Klug Farm (St. Joseph, MI), Nick and Todd Nichols of Nichols Farm and Orchard (Marengo, IL), LouisJohn Slagel of Slagel Family Farm (Fairbury, IL), Kim Synder of Faith’s Farm (Bonfield, IL), and Vicki Westerhoff of Genesis Growers (St. Anne, IL). Some of the recipes in the cookbook can be challenging, such as the multi-step cassoulet that takes about three days from start to finish. But most are not, and you can produce very reasonable facsimiles of delicious dishes served at The Publican. 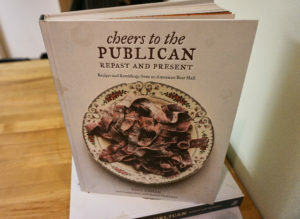 I bought Cheers To The Publican during a Dec. 7 event at Read It & Eat, a bookstore that also stages cooking classes, located in Chicago’s Lincoln Park neighborhood. The discussion featured Paul and Rachel and was moderated by store owner Esther Dairiam, who serves as bookseller at FamilyFarmed’s Good Food EXPO in Chicago. I wasted no time before trying one of The Publican’s signature dishes: Publican Chicken. 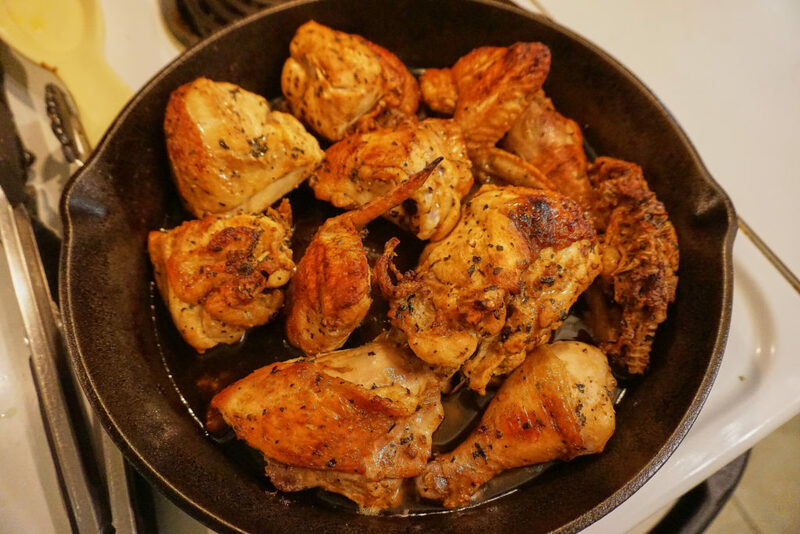 The preparation is no more difficult than for any other roasted or grilled chicken dish. What makes it amazing is a marinade that happens to be amazingly easy to prepare. I also blended a spice mix — taken from a recipe for Barbecued Carrots — that has quickly become a go-to seasoning in my home kitchen. I did vary from the recipes a bit, reflecting an oft-cited axiom that cookbooks are meant to provide guidance rather than religious exactitude. For instance, the chicken recipe calls for the bird to be boned and butterflied (split in half so it lays flat on the grill or in a pan). I can testify that the marinade works beautifully with bone-in chicken parts. Both the chicken and spice mix recipes called for espelette, a spicy-sweet chili of French origin; not having any on hand, I substituted Spanish smoked paprika. And the spice blend called for more cayenne pepper than I cared to use, so I simply reduced it. 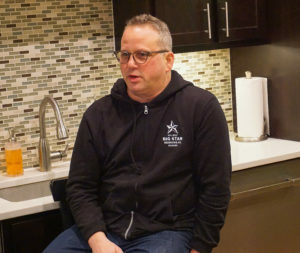 Paul Kahan is 55 years old. He learned his craft working for Erwin Dreschler and Rick Bayless, chefs who pioneered local sourcing in the Chicago restaurant community. He has been a culinary star in his own right since opening Blackbird in 1997, has seen One Off Hospitality grow to nine restaurants (soon to be 11), and received the James Beard Foundation Award as the nation’s outstanding chef in 2013. Yet this was the first book that Paul has written. He has had a literary agent, Janis Donnaud of New York City, for many years, but three book projects that he embarked upon never came to fruition. Two major things happened that finally made Paul a published author and produced Cheers To The Publican. The Publican itself has become the hub of a mini-empire within One Off Hospitality, which includes Publican Quality Meats, a butcher and gourmet shop with a popular small café, located across the street from The Publican; Publican Quality Bread, located nearby and headed by brilliant young baker Greg Wade; Publican Tavern in Chicago’s O’Hare International Airport; and Publican Anker, a casual dining and drinking spot in the Wicker Park neighborhood. The latter is part of One Off Hospitality’s other hub outside the West Loop, which also includes Big Star, which features tacos; Dove’s Luncheonette, which has a broader menu of Mexican-influenced dishes; and The Violet Hour, whose craft cocktails helped put the term “mixology” on Chicago’s culinary map. If you are stumped for a last-minute gift for one of the foodies in your life, Cheers To The Publican comes highly recommended. And if you’re lucky, maybe the recipient will reciprocate by making you some of that Publican Chicken. 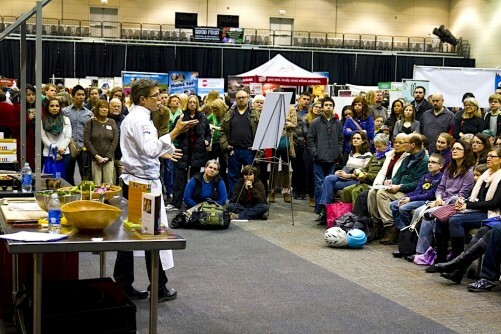 Note: Paul Kahan received FamilyFarmed’s Good Food Chef of the Year Award at our 2016 Good Food EXPO. To read a two-part q&a series about Paul’s career and social consciousness, visit FamilyFarmed’s Good Food On Every Table here and here. 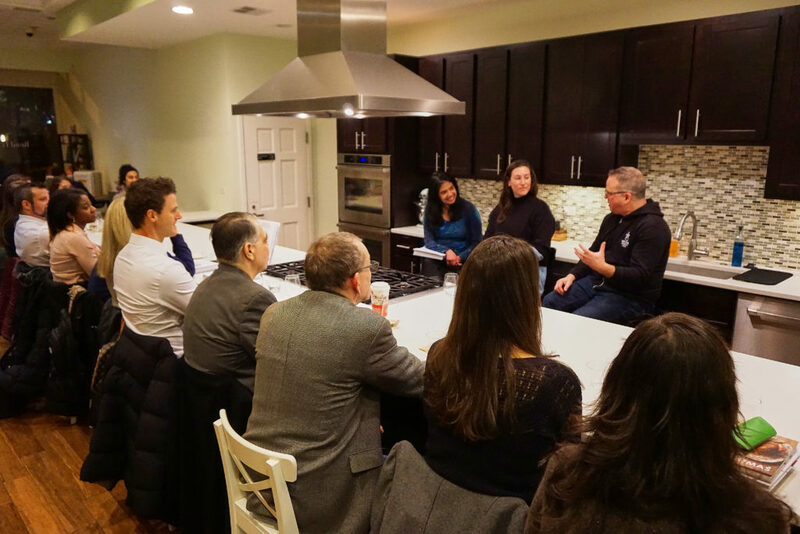 Paul also participated in the Good Food Forum, part of the Frontera 30th Anniversary Celebration that FamilyFarmed co-produced with Chef Rick Bayless and his Frontera Farmer Foundation in April 2017. This entry was posted in Awards, Chef advocacy, Cookbooks, Farm to table dining, Farmers markets, Fish, Food Entrepreneurs, Good Food Dining, Good Food restaurant trends, James Beard Foundation Awards, Local Food, Restaurants and Good Food and tagged Cheers To The Publican, Cosmo Goss, Erwin Dreschler, Evanston Farmers Market, Faith's Farm, FamilyFarmed, Genesis Growers, Good Food Expo, Green Acres Farm Indiana, Green City Market, Greg Wade, James Beard Foundation, Janis Donnaud, Kinnickinnick Farm, La Quercia, Mick Klug Farm, Nichols Farm and Orchard, One Off Hospitality, Paul Kahan, Rachel Holtzman, Read It and Eat, Rick Bayless, Slagel Family Farm, The Publican Chicago. Bookmark the permalink.